A micro lot is 1/10th of a mini lot and 1/100th of a regular lot. Conversely one mini lot equals 10 micro lots and 100 micro lots equals 1 regular lot. Trading 1 micro lot is the smallest amount of real money that most forex brokers will allow you to trade. You should begin your forex micro lot trading program only after successfully demo trading. Successful demo trading might be some level of consistency like 3 to 1 win/loss ratio or some other criteria. You would demo trade first to test the effectiveness of the trading system you have chosen. If you find an effective system and can successfully trade that system in a demo environment, you are ready to start micro lot trading. If you cannot prove in a demo account that your trading system works, you must first find a trading system that works for you and produce profitable demo trades before moving on to micro lot trading. At the point you begin micro lot trading you still have not risked any real money. We believe that almost all forex traders should demo trade their system first, then, if successful, move up to micro lot trading. Demo trading gets you familiar with your brokerage platform and setting orders and stops as well as validating the effectiveness of your trading system out. Forex micro lot trading is a good risk management and money management technique because you can figure out the effectiveness of your trading system and your skills in using that system before committing to larger lot sizes. This allows you to build on your demo trading skills without taking excessive risks. Any trader can trade 2 micro lots with a stop order to continue testing your trading method beyond demo trading. If you are in a profitable micro lot trade you can also practice scaling out profitable lots while learning to manage profits and building equity. With forex micro lot trading you only put up $10 to $50 of your money on a trade and using the 50:1 or higher leverage to your advantage. If you trade even amounts of micro lots like 2, 4 or 6 you can always scale out half of your lots and practice your money management techniques and profit management techniques when you have profits to take. With micro lot trading you are learning how to make $50 on a trade before you ramp up to full scale lot trading, where you would be looking for larger profits. Trading micro lots can also help to keep your emotions in check. There is not much emotional attachment to trading 2 micro lots with a 30-40 pip stop. You can measure your success day after day with small amounts of real money and build equity in a small trading account in the meantime. Micro lot trading teaches you about position sizing in a live trading account, with low risk. When you trade micro lots you can learn about leverage and margin simply by observing the account balances fluctuate when you are in a live trade. When you are in a live micro lot trade, you can watch the balance, equity, margin amount, free margin, and profit or loss values. This is solid educational value for your future live trades. Many websites have lot size calculators and pip value calculators. These calculators are fine but actually trading live with micro lots and watching your account margin and free margin balances are a much better teacher. 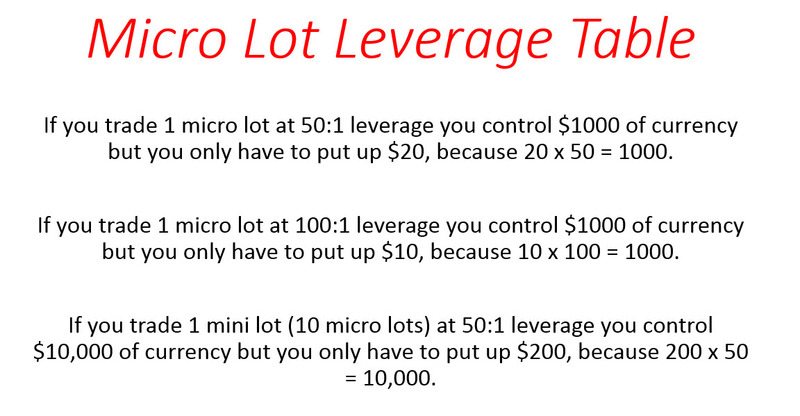 Micro lot trading will teach you all you need to know about leverage. Same thing for position sizing. Many forex traders ask: How many lots do I trade?? Once again, trading live with micro lots and watching your margin, equity and free margin balances fluctuate during a live micro lot trade will teach you how to not over leverage with live examples. A series of 10-20 micro lot trades will give you a load of experience that cannot be matched with an online calculator. You will learn how many lots to trade naturally and never over leverage your account. When you want to progress from micro lots to larger trade amounts like mini lots you can still use micro lots effectively, just use larger amounts of micro lots. Example: If you would like to start trading 2 mini lots just trade 20 micro lots instead. If you are in a profitable trade, micro lots will facilitate scaling out lots at multiple price levels. This is convenient for profit management. To facilitate micro lot trading make sure your forex broker of choice offers trade sizes in micro lots, here is a handy guide for finding a good forex broker. Conclusions – The benefits of forex micro lot trading and contribution to the overall success of any forex trader is quite clear. After you demo trade, progressing to micro lots will teach you many valuable skills like profit management that will help your account grow over the long term.